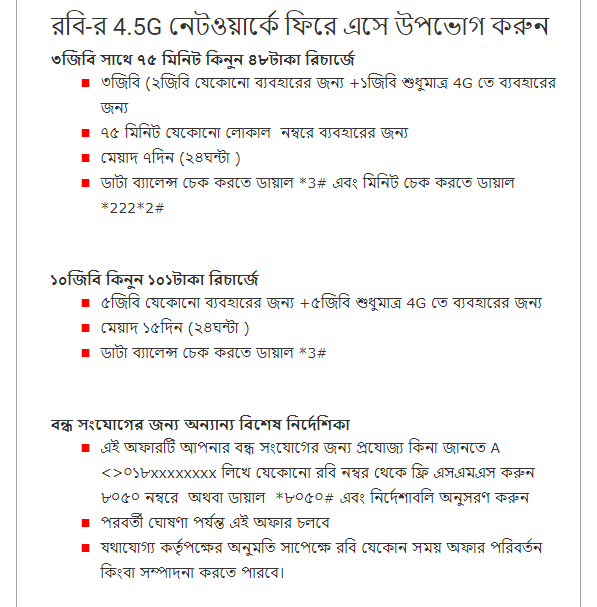 Robi brings a special internet offer for the reactivation Sim; This offer is also called Robi Bondho Sim offer, Robi Winback offers, Robi silent Sim offer. The Robi give 101Tk 10GB internet bonus, it’s a fantastic offer for Bondho Sim. Also, get 48tk recharge 3GB with 75 minutes talk-time. Dear visitor, if you have any Bondho (reactivation) Sim, please check your status you will get this offer or not! Because of 10GB at Tk101 internet offer eligible for only selected Bondho Sim customers. To know Robi Bondho SIM Offer 2018, 10GB Internet @Tk101 Validity 30 Days full information, Please follow this content. Return Robi’s 4.5 G Network and enjoy 10 GB @ Tk101 for 30 days. 3GB internet, 2GB regular data, and 1GB 4G network. 75 Minutes talk-time all operators. Validity this offer 7 Days. 5GB for use only in 4G. To activate this offer customer need to recharge BDT 101. The validity of data volume 30 days. You can use for 24 hours. Dial *3# to know your remaining data volume. To check eligibility, Robi subscriber can send free SMS from any Robi number in the following method: A018XXXXXXXX to 8050 or can dial *8050# put Bondho Sim number by the next instruction. This offer will continue until the next notice. Note: This offer only can enjoy selected customer under Bondho Sim. Offer source Robi official webpage.